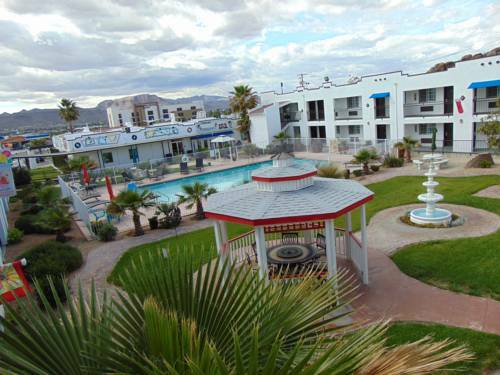 Visit sunny Kingman, AZ and choose the Ramada Kingman. Enjoy complimentary 24-hour local shuttle service to nearby destinations like the Mohave County Fair Grounds and Hualapai Mountain County Park. This facility is located on Historic Route 66, within easy reach of Kingman Regional Medical Center, UniSource Energy Services, Nucor Corporation, National Bank of Arizona and many other company offices. Take advantage of complimentary wireless Internet access, complimentary hot breakfast, guest laundry, and complimentary parking for cars, RVs and trucks. Relax or recharge in the fitness center and outdoor swimming pool. Spacious guest rooms feature desk, iron, ironing board, hair dryer, coffeemaker and flat screen HDTV. Please inform the front desk if you would like a microwave and mini refrigerator in your room. In-room dining is available between 6 a.m. and 10 p.m. daily. Onsite restaurant serves American cuisine and cocktails in a casual setting. Pets are welcome for a nominal fee.